Even if you don’t think this topic is relevant to you today, I encourage you to take a look to ensure you keep all of your teeth. The CDC now reports that about half of all adult Americans suffer from periodontal disease, with 8.5 percent of all adults having severe gum disease. And even worse, 23 percent of all adults aged sixty-five and older have lost all of their teeth. I have known the author Rami Nagel for a number of years and have collaborated with him in the past. 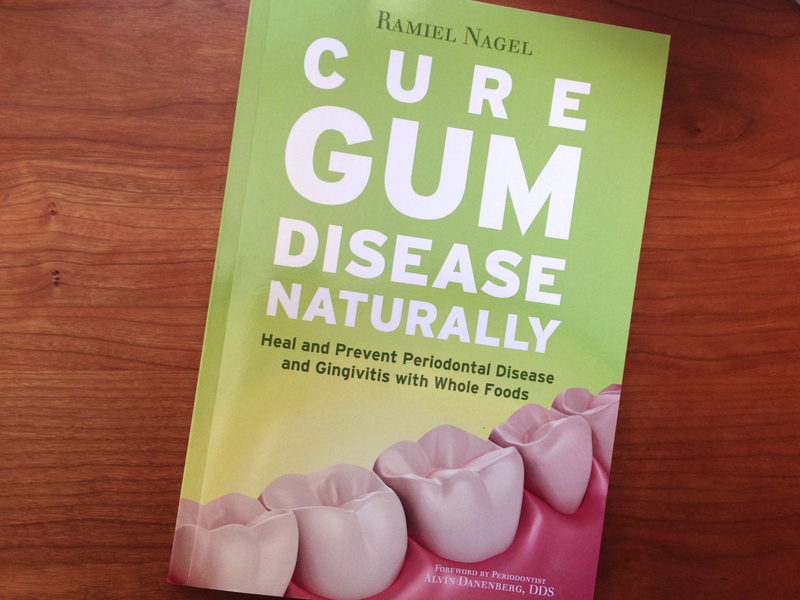 Most recently, I feel very honored to have served as one of the editors, as well as a proof reader for Rami’s new book, Cure Gum Disease Naturally, which we recommend via our Amazon affiliation. I also supported some of the layout and visual communication. I have read the book several times over during it’s evolution and will continue to keep it as a valuable reference now that I have the published copy in hand [pictured above]. This review is written from my perspective as a reader who leads a community committed to how we nourish ourselves and our children. I think this book is incredibly informative, and inspirational because Rami invites and empowers each of us to truly nourish ourselves so that we can heal. Over several chapters, Rami methodically explains the true reason why this kind of disease happens in the first place, and offers us very detailed step-by-step instructions on how to reverse it. Gum disease [periodontitis} is believed by the dental establishment to be a result of improper oral hygiene that allows bacteria in plaque and calculus to remain on the teeth and infect the gums, however, after I read this book I became convinced that it is due to a lack of proper nutrition. As an example, Dr. Harold Hawkins found that 70 percent of his patients with dental problems tested having borderline or low vitamin A levels. Vitamin A plays an important role in vision, bone growth, reproduction, cell division, proper prenatal development, and cell differentiation. Vitamin A is crucial for healthy bones and, together with vitamin D, stimulates and regulates bone growth. We want to stimulate bone growth because gum recession is really bone loss in the jaw. Any impairment in liver function impedes vitamin A assimilation, so it is important that we have healthy livers. In his book, Applied Nutrition, Dr. Hawkins attributed vitamin A deficiencies to the use of pasteurized butter and milk because the industrial production of butter and milk rendered them low in vitamin A. Many other vitamins and minerals are implicated in gum disease as well. As Dr. Weston A. Price observed, the health of our teeth and gums reflect what the overall health of the rest of our bodies is. Clearly what we eat or don’t eat and how we live our lives impacts our health on every level. Some of the information I read in Cure Gum Disease was familiar to me as I also educate about Dr. Weston A. Price’s research and the importance of nutrient dense foods. Nonetheless, I still learned a lot that was new to me, while some concepts were further reinforced. I think this book is a powerful companion to the best selling Cure Tooth Decay, and will serve those who read it with a clear path toward a cure. I recommended Cure Gum Disease to the Nourished Book Club I created, and a number read it and wrote excellent reviews on Amazon. I will share this book with the dentists I’ve seen past and present. I believe that someone who follows the recommendations outlined in this book will experience a benefit to all aspects of their health. After 30 years and 40,000 blood tests, Dr. Melvin Page, author of Your Body is Your Best Doctor, discovered and confirmed the biochemical conditions that cause tooth decay and gum disease: a disturbance in the ratio of calcium to phosphorus in the blood. A ratio of 8.75mg of calcium per 100cc of blood, and 3.5mg of phosphorus per 100cc of blood, with normal blood sugar levels, creates immunity to both tooth decay and gum disease. Raymond Forbes reports that the healthy blood sugar level is around 85 milligrams per 100 cc of blood. If those two criteria are met then alveolar bone resorption ceases. The alveolar bone is the thickened ridge of bone that contains the tooth sockets on bones that hold teeth. In humans, the tooth-bearing bones are the maxillae and the mandible. According to Raymond Forbes, when there is a low level of blood phosphorus over a period of several months then tooth decay develops. And based on this same research, when there is a low level of blood calcium over a period of months, gum disease begins. One recipe for creating gum disease is a diet high in meat and grains and low in calcium from dairy products. A diet that heavily favors meat and grains and is also low in calcium is disproportionately high in phosphorus and can contribute to a calcium/phosphorus imbalance in the body that may lead to gum disease. Nearly every packaged, industrially processed product that contains grain should be eliminated from the diet. Also avoid sprouted whole grain products and gluten-free foods made with brown rice. These industrially made products often contain additives such as anti-caking agents, stabilizers, leavening agents, or acidifiers such as tricalcium phosphate, trimagnesium phosphate, disodium phosphate, and dipotassium phosphate. Many times these chemicals are not even listed on labels. These additives are another reason to avoid commercially produced foods. When I searched Google on the topic of gum disease, Listerine came up as a preventive measure. I don’t believe that Listerine will solve the problem because it doesn’t address the true cause. Rami offers readers a clear path to cure gum disease naturally that doesn’t involve scaling, root planing, gum grafts, flap surgery, or chemicals. I think the book is very well written and clearly outlined. I was surprised at my own level of interest in the material! I like the fact that Rami reviews what patients will likely face when they enter a dentist’s office and explores different approaches we may take to handle our options. I also like all of the home care recommendations included, as well as the breadth and depth of the information offered about nutrition, which is foundational to a cure. Most chapters offer a summary of key points to solidify what has been taught. I can’t recommend this book more passionately. It is a must-read, as both a preventive measure and as a clear blueprint on how to heal. I deeply appreciate the considerable amount of time and effort Rami invested so that we may all benefit. Have you experienced any symptoms of gum disease and if so, what have you tried to cure it? Alternatively, let us know why you are interested in reading this book. I have many of the symptoms of gum disease. I am trying different supplements to help. I should read the book. It sounds very interesting. I have several symptoms of gum disease. I have receding gums, tender gums and tooth sensitivity. Sometimes I have pain chewing. My dentist has not recommended anything to me so I would like to learn more about taking charge of my own gums. Hopefully I can teach my daughter and granddaughter as well. Thank you! I had serious tooth pain last year in one back tooth which is higher than the others, and I grind it in my sleep. It is still a bit loose and I believe there is gum disease around it, but my gums don’t bleed. One thing that helped me greatly is a waterpick with warm water and hydrogen peroxide. I am not really sure how to get my minerals balanced, from an obvious imbalance with a hair analysis. Since doing my raw milk fast (and one day eating a grapefruit) my teeth are now very sensitive to cold. ugh. I wonder if that restrictive diet could create a further imbalance?! If you aren’t chosen to receive the book, I highly recommend it as I think it could address what you are facing. Yes, I have some of the symptoms of gum disease. Right now I’m oil pulling with coconut oil. I really want this wook so I can treat my gums naturally, and without having to go to the dentist. I have several cavities as well as sensitive gums that bleed often when I brush my teeth. These are minor symptoms of gum disease, but I know that if I do not make changes soon, things will only continue to get worse. I strive to eat as clean as I can, but I am often not as good as I should be. I take fish oil on a mostly regular basis, and sometimes manage to oil pull, but not near as often as I would like. I’d love to read this book to be able to really understand what it takes to heal my mouth from the inside so I can surprise my dentist with fewer cavities and a healthier mouth on my next visit! I have some sensitive teeth and bleeding gums on and off. I don’t know if that’s actually gum disease, but I’ve tried oil pulling daily, and swishing colloidal silver. The sensitivity comes and goes. I do have some symptoms of gum disease like the shifting of teeth and sensitive teeth. My husband is in the beginning stages of gum disease. My mother lost her teeth at 19 to gum disease. My father was in his 40’s when he lost his teeth to gum disease. I have had trouble with my teeth my whole life. I have my husband using a Bass toothbrush with an essential oil blend from Orawellness and he is using a tooth and gums tonic to rinse with from a naturally minded dentist in my town. I would love to read this book about healing gum disease naturally so that I can help my husband to keep his teeth. Yes I have experienced many symptoms of gum disease but I feel that I now have it under control, thanks to the recommendations of the Mr. Nagel and my own research. Years ago I had a traumatic event in my life and I neglected my oral hygiene which took me to a periodontist who did the full mouth gum surgery on me. I believe that that set me up for the lifetime of gum issues. I had a bad infection in one of my front teeth; the local dentist told me the tooth would fall out. That was 3 years ago and it is still there; it is not loose at all anymore (but to be honest it hangs down a tiny bit below the one next to it). I take FCLO and make raw milk kefir, also Vitamin C daily. I have an irrigator which I use daily. I would thoroughly enjoy reading the new book. Thank you for what you do. My husband has been struggling with gum disease for over 20 years and has had the deep cleanings below the tissue done at least three times AND goes in for cleanings 3-4 times a year. While suffering from other illnesses that seemed unrelated, his periodontal disease worsened despite the same religious habits of cleaning and changing our diet. His gums were swelling worse than before! We finally started seeing a more holistic doctor for the other illnesses and put him on a food sensitivity diet (gluten free, among other things that were causing inflammation). Within two weeks the swelling started to go down. We also discovered he was too low in other vital nutrients and started supplementation. Things have continued to improve, but it seems like we still don’t have all the answers as it hasn’t completely healed and disappeared. I can’t wait to read the book and see what else we might be missing that will be the final pieces to the puzzle! I can’t wait for you to read the book as well! I think it will be of great value! I so wish I’d known about this ten years ago….I might have been able to save my teeth. I have tried to encourage my kids and friends to be better stewards of their teeth than I was. While I’m not ashamed of the choices I made, I do know that I’ve radically changed so many things in my life, including some restrictions on travel/adventuring. I would love to read the books you’ve mentioned and learn what I can do now to prevent further bone loss. And I should also say that I didn’t know about gum disease and why my teeth were so fragile. The elders in my family had the same issues. It wasn’t until years later that I discovered much of the tooth decay could be attributed to one “treat” — soda pop. I’m interested to read this book, partly because I feel like I’ve exhausted all my dietary “options,” so to speak. I came to a Traditional Foods way of eating after a lifetime of vegetarianism, when I was 30 and had gums that were rapidly receding. I’ve noticed some improvements after doing GAPS, and then a super-nutrient-dense low-carb version of same. But the improvements have largely reversed, although I still consume a very nutrient-dense, traditional foods diet with moderate carbohydrates (mostly now in the form of starch). I’d love to improve my gum health, but I’m also a little skeptical: is there anything further that I can do using “diet alone,” or do I need to pursue some more aggressive treatment that is less holistic, but might save my teeth? The jury is still out! Would love to have this book as a resource for clients. I enouraged oil pulling for ongoing health and have reversed a cavity for myself with this method. I have had gum recession and tooth sensitivity for over 25 years, and have had the deep gum cleaning and planing done about 15 years ago. I diligently brush and floss and have been doing oil pulling with coconut and essential oils daily just to maintain the health of my gums. But, I really would like to get this book to learn how to reverse this process! I have been eating primarily a Weston A Price/gluten-free diet for most of past 5 years, but have methylation/detoxification issues and heavy metal toxicity so I have’t seen a rebuilding of the teeth/gums yet. With concerns now about osteopenia also, more than ever, the time is now to discover how to sufficiently mineralize my body for strong teeth and bones! I had gum disease but didn’t know much about nutrition then. I went the regular way with a periodontist. He cut my frenum out hoping that it would help lessen the plaque on my gums. However I still have gum disease. Now that I know a lot more about nutrition, I eat a very healthy diet with lots of raw milk, healthy fats like cod liver oil, raw butter and coconut oil, take probiotics, eat grass fed protein and very few grains and no gluten. I brush and floss regularly to keep the gum disease at bay. I’m interested in reading the book so I can help other people with gum disease use nutrition to help their situation. Thank you so much for your review of Rami’s book on Gum Disease. I have had gum recession for about 10 years. And, just as of this year, I have an area that is getting worse. My dental hygienist recommended using a water pik, which I think has helped. Recently, I have also eliminated all grains from my diet, which I’m glad to hear is helpful with gum disease. There are 4 people that I know who all had to get dentures at some point in their lives. They definitely did not know about the nutrition connection to preventing dental decay and gum disease. I am excited to read this new book by Ramiel Nagel. I have read his book, Curing Tooth Decay, and was very impressed with the information. I have not had to battle gum disease so far, but my husband has had some painful gum symptoms in the past year, and my parents are at the age that they are now that they are starting to experience some symptoms of gum disease. I would like to learn more about what can be done to prevent gum disease for my family and myself. Thank you, Sandrine, for your book review to let us know about this great new book! Although I don’t currently have symptoms of gum disease, my teeth have always been susceptible to decay, even eating in the Weston Price tradition. At some point I am sure I will struggle with gum disease. I have read Ramial’s “Cure Tooth Decay” book and enjoyed it a great deal and didn’t realize he had come out with another. It will be very interesting to read! I didn’t experience symptoms of gum disease personally but I have members of my family that have this problem. They didn’t try to cure it naturally, they have dentists that handle the problem like they always do, ” just solving the symptoms not the cause”. I wonder why this days more than ever people suffer from this problems, it always come down to food, and what is in the food. I’m really interested in learning how food (can a good balanced diet) can prevent and/ or cure this disease, to help my family and to prevented for myself. I have experienced a lot of cavities, despite eating a healthy, whole foods diet. I have tried fermented cod liver oil to try to remineralize my teeth and it does seem to make my cavities hurt less when I take it consistently. But most importantly I wanted to share that my 3 y.o daughter has a rare genetic condition called cri du chat. It is very common for CDC kids to have a lot of dental issues – crooked teeth, jaw misaligned. I have been giving my daughter FCLO since she was 6 months old and her teeth thus far are healthy and straight. So that has made me a believer in how important nutrients are for are teeth. I would like to continue on a positive path to keep my daughter and my teeth healthy and hope to share this with our CDC online support group! I have had terrible gum disease and still do. I’ve had 3 teeth pulled recently because I didn’t want a second root canal on them. Severe tooth pain and with no dental insurance, I was desperate so I finally listened to my wife’s advice and cut out most grains, especially gluten, and started taking the cod liver oil she gave me months ago. To get rid of the pain she gave me some clove essential oil and I put that directly on the teeth that hurt and it was instant relief! Since then it’s been a month and I’ve had no tooth pain at all. They seem to feel more sturdy in my mouth too instead of all of them feeling loose. I’d like the book because I want to learn more and also, my wife is a complete nerd and doesn’t have this book yet and I know it would make her very happy to have it, including the effort I put into this! Thank you. i have been taking my husband to the dentist over the last two months and we have had to spend a fortune in dental care. i know that I too have dental issues including gum disease but I do not want to go through what he has. I have been using a herbal oil and a special brush from ora wellness and I think it is helping. I also take cod liver oil butter blend and try to eat right.How true it is that we are what we eat and I am sure I could learn a lot from this book Cure Gum Disease. I am a nutritionist and eat pretty healthy but I know I still have a bit of gum disease because I see evidence once in a while of bleeding. I am also concerned about three root canals that I have. I wish I didn’t opt for having them years ago. Weston A. Price’s work was so inspiring! I would love to have the opportunity to read the book, change even more of my habits and share my experiences on my upcoming blog. I am a WAPF DC Chapter leader and I eat very well. Still, I have some issues with gum disease. I would love to find a way to reverse the gum disease naturally. My conventional dentist suggested antibiotics, but, of course, as a long-time WAPF member and health coach, this is not an approach I want to take! I’m eager to hear more about how to fight gum disease with nutrition. I am a Registered Dental Hygienist and educate my patients on the link between poor nutrition and gum disease. There is some limited information on this link and I am doing my best to have information for my patients and also for the dentists I have worked for. I would greatly appreciate your book as another tool of information I can use to educate myself with and to share with others! Thank you! I have a gum disease that expresses itself as receding gums. I am nutritionally aware and practice only natural and mostly organic ancestral diet. Yet, I have not been able to affect my gum disease. As I am able to use myself as a test subject I would appreciate some guidance (from the book) as to what else can I do to improve the state of my gums. I have had several symptoms of gum disease. My family eats healthy, but there is obviously more for us to learn because at my young age I have worn through the enamel on my teeth. I have been told I need crowns. I would really like to know if there are options for someone who has already cracked their teeth, to avoid crowns, root canals, and extractions. My daughter is 5 and I would like to help guide and heal her teeth starting now so hers are healthier than mine when she becomes my age. There are many natural resources for general decay, but we need to go deeper. How do we guide our children? And how do we address the bigger issues that have come up for adults? Thank you. I don’t have any symptoms but am very interested because I worked as a dental hygenist. I left the field because I no longer agreed with the standard of care . I am very interested because I would love to learn about alternative methods of care. After many years of progressively worsening gum disease, in the last few years I have been able to prevent it from getting worse. Several ‘deep cleaning’ sessions, and quarterly regular cleaning sessions, combined with frequent flossing seem to be able to maintain the current condition. Flossing with little brushes works better for me, and water jet flossing seems beneficial for harder to reach areas. I also have used mouth rinses from time to time, but the problem is that those remove both the bad and good bacteria, so I prefer to minimize using chemical rinses. I have also eliminated most refined foods from my diet, but I expect additional diet improvements could be helpful. I have been searching for information that might help me to better attack the true root cause, and hopefully to reverse the condition so that gums recover. I am thrilled this book is published, and I am eager to read it soon. My husband had an abscess with loose teeth. He was able to restore his gum health with calcium ascorbate powder for brushing and using coconut oil for toothpaste. Thank you for looking for the solution instead of patching the problems. Yes, despite regular cleanings and a healthy diet, I have experienced gum disease since I was in my early 20’s (I am now 53). Most people chalk it up to heredity since both my mother and grandmother lost teeth to gum disease in mid-life. I had one session (about 10 years ago) of root cleaning with a periodontist and since them have tried regular maintenance through my regular dentist, although the expense is difficult and I don’t get in every three months as recommended. I eat gluten only occasionally and grains probably a couple times a week (mainly corn and rice); I don’t eat highly processed food, and pretty much stick to a primal way of eating (meat, foul, fish, veggies, fruits, nuts, dairy). I have been eating this way for about the last 5 years and, despite that fact, I still continue to experience gum inflammation. I would love to see what other options are out there for natural treatments. Thank you for asking! I have multiple symptoms of gum disease. My dentist has been no help. I have used a homemade toothpaste. That has helped with the bleeding and sensitivity. I am researching more and have come across this book many times! I need to read it! Yes, I have experienced some symptoms of gum disease. My gums have always bled easily and even moreso now that I’m pregnant. Also, I am fairly certain that my gums are receding around a couple of my bottom teeth. I sort of assumed I would just have bad teeth because my mother does, and my mother-in-law does too so I want to be able to protect my daughter’s teeth. I have tried to cut most processed food from my diet and tried oil pulling for a short time though I hate the texture of oil. I consume raw milk on a regular basis, but I know there’s more I could be doing. I would love to read the suggestions in this book for healing my mouth. During this battle with trench mouth, I developed a mid-grade fever, and multiple sores in my mouth, and throat, that nearly caused me to past out, and ultimately to lose 9 lbs, in less than a week’s time! I literally could not eat a thing! From that point on in my life, I would experience (and still do), episodes of bleeding gums, and recession of my gums, to the point of nerve sensitivity. This is an ongoing battle for me, along with the confidence-eroding issue of halitosis, and constant need to mask it, with aspartame-laden gum chewing! In almost all pictures taken of me, I smile a closed-mouth smile! I would love a chance to HEAL this gum disease issue NATURALLY, and have been avidly seeking the research and methods, to do what dentists have said I cannot do! I have not experienced gum disease but I am halfway through my certification to becoming a Nutritional Therapist Practitioner and I love reading up on anything that can help with future clients and possible issues. I’ve had inflamed gums before and currently have receding gums. I’ve tried to treat with Vitamin C as well as Golden seal and Echinacea. I’d love to know a better solution, which is why I’m interested in reading the book and keeping my teeth! OOps, need two more sentences-I’ve read Rami’s other book Cure Tooth Decay. I’m implementing those protocol items and would like to pickup a few more for gums. My husband has gum disease. We have made progress, but still have a ways to go. I loved Cure Tooth Decay, and have used some of the information when dealing with issues with my kids. For the gum disease, we have used different herbs and oils to combat symptoms. We also have been following a more traditional diet, and increasing fish oil and organ meats. I’ve done so many things to try and stop my gum disease: herbs, oil pulling, diet, homeopathy and of course regular cleaning and really good hygiene. I have receding gums, thankfully that’s really the only symptom. I am really focusing in on strengthening my immune system: clearing out sub-acute infections and prior damage from pharmaceuticals to hopefully stop the process. I am very excited to read this book! Nagel’s first one on tooth decay was excellent. Sensitive teeth, that is my symptom of gum disease. I have tired fish oil which seems to help a great deal. And I have even changed my diet tremendously. I have wanted to purchase a book on treating gum disease for a while now so I can better understand the science behind it. This would be a great book to have! I’ve been struggling with symptoms of gum disease for many years which I attribute in large part to a pharmaceutical given to me 23 years ago. Gum disease is but one of a host of health issues I face, yet it is not which is understood by health professionals. My health cannot tolerate the flap surgeries recommended to me, nor can i tolerate further gum infections. I believe we must all be our own best health advocate, so I must read the book. I know healing my mouth will be helpful to my overall health. I have had gum disease for a number of years now. I have receding gums, bleeding gums, shifting teeth (especially in the last 2 months! ), swollen gum line, sensitive teeth near the gum line, and exposed roots. A few years back I used IPSAB powder to help heal my gums and it really helped. My dentist at the time complimented me on the health of my gums, said that they were nice and tight. But I still had a few other symptoms present. As soon as I switched back to toothpaste (even natural) my problems returned. So, now I have resorted to tooth powders again but found that just brushing with them doesnt help much, i have to leave them on my teeth overnight. I’d love to know what I can do with my diet to cure the problem from the inside out vs trying to help it from the outside. thank you for the opportunity! I have most of the symptoms of gum disease and would like to learn about natural ways to heal this disease so I am very interested in this book. I first suspected I might have gum disease when I noticed my gums bleed easily and my teeth seemed longer and gums looked looser. I have eliminated sodas and as many processed foods as possible, increased my consumption of vegetables and added bone broths to my diet. I also started brushing my teeth with a coconut oil based toothpaste. I want to read this book because I want to know if I am on track and if there is more I can do. My sister has been treated for gum disease and I do not want to go through what she did. My mother had a dental check up today, and I was disappointed at the inflamed gums and new cavities. Their solution was to get an electric tooth brush, 2X a day, and rinse with fluoride. My mom had a stroke 6 years ago, and I would enjoy the book to help family and friends. Someone had a partial root canal a year ago. I told her not to do it, ugh. My gums look great, but about 20 years ago, I had asthma so bad, that I went to the dentist every 3 months for gingivitis. Gum disease will blindside you, and therefore, people do what the dentist tells them in the confusion of the moment. I am very interested in this book. I have been fighting gum disease for many year. I have teeth cleaning and scraping every six months and I have had laser gum surgery several years ago and now my dentist has referred me to an endontist because of bone loss in my front and side jaw area. I recently had a bone density scan done and it reveals a loss. I just had calcium level and vitamin D levels checked and they are ok. I had not heard about the phosphorous/ calcium levels being important. Thanks for the opportunity to read this book. My previous dentist was appalled at my dental hygiene. My gum pockets had always been deep, so she suggested antibiotic injection and deep cleaning. I did both, and my gum pockets still didn’t change. She told me I had bone density of an old woman. This was about the same time I adapted WAP lifestyle and got on the GAPS diet. We changed to a fluoride-free, mercury-free dentist, who doesn’t measure gum pockets and says my bone density seems to be fine. But then again, I cut out grains and sugar, and have been eating ferments and drinking bone broth daily. So gone are the days of gum disease. I am very interested in reading this groundbreaking book. I have always been interested in a natural diet, and to think I can not only cure my gum disease but balance my entire system is compelling. I suffer from bad brushing technique – too hard in front, not enough in the back – so recently I had deep scaling on my back teeth and need a graft on one tooth in the front. If I could reverse the front decay I would be thrilled. I’m also a chef and it would be yet another way for me to educate myself and others on another importance of a healthy diet coming from foods with real nutritional value through beneficial farming and processing practices. The main symptom I have of gum disease is receding gums. I have endeavored to keep my mouth clean with brushing and flossing and by using a salt water rinse. I would like the book because I am on a limited fixed income. I believe strongly in the importance of correct diet. I have overcome asthma and cancer in the past with fasting and diet. I believe this is a better course of action for me than medicine, which has too many bad side affects. I have had these symptoms of gum disease for many years. I have gone through many visits with the periodontist, had surgery and still are trying to keep at least most of my own teeth. I would be very interested in reading this book and making changes to my diet. Thanks for offering a chance to get this book. I have many of the symptoms of gum disease to include: persistent bad breath, a couple of loose teeth, the formation of deep pockets between teeth and gums, and receding gums. I have numerous filled cavities. I didn’t properly take care of my teeth for many years and didn’t go to a dentist for years, as well. I finally went to a dentist a little over a year ago to have a cracked tooth taken care of. It was a traditional dentist & he recommended the traditional (deadly) root canal & cap. I had the root canal done & had to wait for my fitted cap to come in. That night, after the RC, I picked up a book that a friend had given my wife, “Healing With Whole Foods” by Paul Pitchford (1993 Ed.). As I was scanning the table of contents, I saw at the end, and appendix titled ‘The Effect of Root Canals on Health’, so of course, having just had the procedure performed, I read it. I was completely floored. It introduced me to Dr. Weston Price & his studies on root canals. A week later, I had the remainder of the tooth removed completely by a holistic dentist, and I have been working on diligently taking care of my teeth ever since. I have changed my diet to eliminate ALL refined sugar, and only use unrefined cane sugar & raw honey sparingly. I use a home-made toothpaste of baking soda & unrefined organic virgin coconut oil. I am reading another book titled “Tooth Fitness” by Thomas McGuire, D.D.S. (1994). I am trying my best to take back my tooth, gum, & overall health. I would welcome any additional resources to assist me in that endeavor. I know this is a bit more than the required 5 sentences, but I wanted to explain why I would love to get a copy of this book & I can only hope that you will choose me as one of the recipients. I have gum disease and have had for years. Lately the halitosis is the symptom most concerning to me. There is some bleeding, and pocketing in the gums. I know I have nutritional abnormalities, evidenced by metabolic syndrome. I am sure this book would be very educational as I continue my journey to improved health. I have done the oil pulling and floss, but neither routinely, several times per week. Trying to improve. I have a receding gum line and plaque build up. I’ve tried charcoal and coconut oil. I’ve started using with my children. I notice that my mouth breathing daughter has a changing jaw line and would love to know more about how to help us all. I am interested in this book as I have had receding gums for 15 years and they are getting worse. It started when I went through a phase of brushing my teeth 3 times a day for a few weeks, instead of my usual two times per day. My husband has the same problem but worse as his bleed. I have tried oil pulling and blotting. It hasn’t really helped enough. I would love to learn more from the book for further prevention/reversal. I work in healthcare as a nurse practitioner, particularly geriatric patients. My particular job is focused on health and prevention and I try to always incorporate the importance of diet and dental health in my visits. I believe Weston A. Price’s principles are the mainstay of our nutritional foundation, his book inticed me to gain a better understanding of our nutritional needs. I have read several articles, in addition to his book, about nutuition as it relates to dental health, but have always been interested in reading a book that collates the scattered information I have read. My father had gum disease and lost almost all his teeth to it. That was the time when they recommended swishing hydrogen peroxide in his mouth. That was the only treatment and obviously it didn’t work. My mother also has had problems with her dental health. My husband and I follow the dietary guidelines of Weston A. Price and have good dental health. I wish to share Dr. Rami’s book with my friends and co-workers how diet is so very important, especially for good dental health. I am so excited for this book! I read and have been using Cure Tooth Decay and it worked for my son. Yet I still struggle with gum disease. It’s decreased with increasing Vitamin C but I want to know how to reverse it. Is there information about possibly re growing what is lost? There is so little information on gum disease! This book is so needed. So much joy that Rami tackled this topic. My gums have bled since i was in my early teens. I was always told if i flossed my problems would be solved, but they increased and it didnt end my troubles. So i gave up and thought it was normal for me. Then i had kids amd started having pickets and receding gums. I am so scared I will eventually lose my teeth over the fact that noone has had any solutions!! I have amalgam fillings so can’t oil pull either. Rambling now cause I am overwhelmed with excitement that there are answers. Thank you for writing this book! I currently have gum disease, but oil pulling has helped tremendously. I believe coconut oil has helped as well. Even though I want to heal and prevent gum disease in my husband and myself, I have a child and do not want her to have these problems. Teaching her proper methods young will help ensure this. I would really like to own this book. Thank you! Greetings…. I am very interested in learning about how I can cure gum disease. The body is a powerful healer, if it is given the right tools. Diet is a main factor in many issues including gum disease. I have several symptoms, and my experiences at the dentist has been a deterrent to care. I used essential oils, coconut oil pulling, an assortment of mouthwashs, and home remedies to cure a toothache. I would love this book to add to my arsenal. I have the cure tooth decay book and would love to read the gum disease book! I believe i have gum disease although my dentist has not said anything. I have 5 cavities i have been trying to heal over the last year based on ramis book. I am not perfect at avoiding processed foods and sugar but i am improving. I have added raw dairy, liver, bone broth and soaking my occassional use of beans and lentils. I cut out grains except occassional sourdough bread and white basmati rice. I consume fclo and have implemented the recommendations from the gum chapter. This is quite a process and there is much to learn. I have loose teeth and recording gums. I have had many root scalings and deep cleanings. I have a few cavities and one broken tooth with an old filling that needs to come out of my mouth. My teeth are also sensitive to hot and cold. They sometimes hurt while chewing. I also now have a gap between myntwo upper front teeth which makes me self conscious. Ever since my permanent teeth came in, they have been very sensitive to heat and cold. My dentist has recommended Sensodyne or a similar toothpaste, but it has never made a difference. I have started taking fermented cod liver oil, removed grains and refined sugar, and started drinking bone broth, but I have not seen a difference yet. (it has been a year on FCLO, two years grain/sugar free.) I also occasionally feel like my teeth shift a little, and usually have red gums. I’d love to get to the bottom of this and heal my mouth. My mother suffered from severe periodontal gum disease when I was a teenager. I watched he experience horrible symptoms & even worse treatment. Now that I am beginning to experience some mild(ish) symptoms, I desperately want to do something to stop it in it’s tracks. I have tried switching to homemade tooth powder and oil pulling. However, if there is more to learn, I want to. I have 9 children an want all knowledge available to make sure that I help them learn how to take excellent care of their teeth & be a good role model for them on that journey!! I’m tired of conventional dentists telling you that you can only help your teeth by adding more chemicals or treatments to them. It’s nice to learn that you can cure gum disease in a natural way. I just started doing oil pulling to see if that will help! I have gum disease. I don’t have the typical symptoms other than receding gums, thank goodness. I eat FCLO, fermented skate liver oil, raw milk, grass-fed beef, chicken broth, pastured eggs, etc. My daughter suffers from eczema and it makes me so sad. I had been a ‘healthy’ vegetarian for 26 years until I read Dr Price’s book and had three children. I don’t understand why I have receding gums AFTER making these changes which make SO much sense to me. I feel very confused, at times. This book might be the missing link. I do have symptoms of gum disease, but have been too scared to see a dental professional about treating it. Now I’ve read a bit about your approach I may be glad I haven’t dealt with it conventionally! Would love to put this into practice. I just got diagnosed with gum disease. I think fluctuating hormones from breastfeeding 4 kids has affected my dental health! I’d love to win this book! My teeth were at its worst during my pregnancies. A filling came out while being pregnant for the first time just two days before giving birth. I got so busy, I didn’t have time (or made it a priority) to have my tooth fixed. It all escalated in the worst tooth ache. I ended up getting a root canal done. I would love to read this book so I can educate myself further about natural approaches to this issue. I’ve been fighting gum disease for years..starting in my teen years..got better for a while..now in my 40’s it’s out of control..I have diabetes and nothing helps..looking forward to read this book, understand the causes and follow your expertise advice and cure it! Thanks in advance! I do have some of these symptoms. Although the dentist has not diagnosed me with any gum disease, I would love to help alleviate these things naturally. I am very much into natural health and wellness so this book sounds wonderful and I would love a chance to win a copy. This type of thing fits right into my healthy lifestyle. Thanks so much for this giveaway! I’ve had gum disease for a few years now. I have a tooth ready to fall out and now I’m pregnant. I could really use this book! I would LOVE this book! I had 3 cavities, basically followed Nourishing Traditions diet, whole raw dairy, eliminated phytic acid in my diet, coconut oil pulling, baking soda toothpaste and FCLO/Butter Oil blend from Blue Ice. Bone broth daily and I was able to stop decay on one (never did get the X-ray to see it), stopped all pain though. The other was on the surface of my tooth and it completely healed over. Praise God! I would love to actually read the book though and work more on my teeth, since I have become pregnant again I have felt more sensitivity in all three cavities but I obviously cannot follow such a strict regimine of a diet while pregnant, though no new cavities have developed. I cannot wait to start working on my oral health this fall! Thanks for the blog post & the giveaway! What a strong testimonial! Thank you so much for sharing it! I have had gum disease in one form or another since my late teens. My mother insists that receding gums are purely genetic, and only surgical grafts will help. After reading “Cure Tooth Decay”, I know there is a better way. While the previous book helped me immensely, my biggest problem is in my gums, not teeth. I am excited to read this book, whether by giveaway or amazon purchase. Thanks for writing it! I have gum disease. Although I have taken very good care of my teeth and got my first cavity last year, my gums are severely reduced, there is bone loss and I have several loose teeth. I have had several deep cleans and see a hygienist several times a year. I brush multiple times daily with a special paste of mineral salts, use my water pick, and oil pull. I have an awesome holistic dentist but he still sees me in dentures within the next couple of years. My mother got her dentures when she was close to a decade older than my grandfather when he had recieved his and I’m older still than my mother but I’m still not quite to my mid 30’s. It’s probably too late to save most if not all of my teeth. However, if I can move forward with the knowledge to help my children stop this in it’s tracks and not get dentures themselves, I would be quite blessed. I have been diagnosed with gum disease. I am very interested to read this book so I can find help. I prefer natural remedies when possible and believe that often they are better! I’m only in my 30’s so I want to take care of my teeth well into my future. Very excited to read! Thanks for the giveaway!! Hi, I would love to win a book! Since learning about Dr. Price a few years back, we have changed our diet so much, that my family thinks we are crazy! But we proved them wrong when we were back from our annual dentist check up with NO cavities!!!! Yahoo!!! (We usually had at least a few cavities each visit) So thankful to have found this valuable information!! Wow! This is the book I’ve been looking for! I’ve battled gum disease as long as I can remember. Every time I’ve been to the dentist, I’ve heard I have some of the deepest pockets the hygienist has seen. I learned recently that each tooth is related/connected to a part of one’s body, much like the hands and feet are in reflexology. This highlighted to me a serious “why” for my lifetime of kidney problems. The kidneys are linked to the front center teeth. Guess which teeth of mine no longer have visible gums? The gums of my front center teeth on the bottom have receded so far, it almost looks like one can see the roots of the teeth. I have believed it could be resolved through diet, but haven’t researched exactly how yet. This book sounds like my answer!!! I have had receding gums for a long time and only recently came into contact with knowledge on how to reverse dental issues when my daughter’s teeth started decaying. That was when I read Cure Tooth Decay and started implementing measures to heal her mouth. Unfortunately, I have not been quite so disciplined with my own mouth and would like to know more about specifically healing my gums. We have changed over to a WAP/paleo diet but I still give in to too many grains and sugars for myself. I was able to cure some issues with diet changes and using tooth suds by Heritage Essential Oils. My gums are much tighter and the plaque buildup is almost non-existent. I went from my dentist recommending a deep debridement to only needing a regular cleaning. I would love to read this book and learn even more about saving my gums. I have recommended Cure Tooth Decay to numerous people and I’m sure I would do the same with this book. As the daughter and wife of a dentist, I am very interested in learning more about curing periodontal disease through nutri on. My husband and I have talked extensively about the difference in oral health in the various socioeconomic populations he has worked with. He has seen first hand the undeniable link between poor nutrition and poor oral health. While this notion is far off from what so many dental schools teach, I believe dentists have the opportunity to encourage patients to improve their health through nutrition. That has beeny approach for our family- not because we don’t have access to highly skilled dentists, rather because I don’t want me or my family to need the type of treatment so many patients need. Thank you for sharing and promoting dental health through a healthy diet. Nourishing Traditons resonated so strongly with me because Dr. Price’s dental approach to studying populations. This post came at a serendipitous moment for me! I always had a clean bill of oral health up until a year ago when my dentist informed me that my gums showed signs of recession – a precursor to gum disease. Yikes! One of my biggest fears is an unhealthy mouth. Since then I have been doing research as to how to correct this as my dentist informed me that it cannot be reversed only stopped from worsening. This is unacceptable! I also recently had a baby and have been following a similar WAP path for my son’s first foods. This book is the perfect blend of info that I need in my life at this moment! I have had receding gums for a long time and only recently came into contact with knowledge on how to reverse dental issues when my daughter’s teeth started decaying. That was when I read Cure Tooth Decay and started implementing measures to heal her mouth. Unfortunately, I have not been quite so disciplined with my own mouth and would like to know more about specifically healing my gum disease. We have changed over to a WAP/paleo diet but I still give in to too many grains and sugars for myself. I was able to cure some issues with diet changes and using tooth suds by Heritage Essential Oils. My gums are much tighter and the plaque buildup is almost non-existent. I went from my dentist recommending a deep debridement to only needing a regular cleaning. I would love to read this book and learn even more about saving my gums. I have recommended Cure Tooth Decay to numerous people and I’m sure I would do the same with this book. I would love to read this book to gain further knowledge in other to have better health. I have receding gum lines cracked teeth, sensitive areas, etc. after many baf years of poor diet. Now that I have learned about the importance of nutrition, thanks to the WAPF, I am making changes in my life to gain better health and thereby, have a healthier lifestyle. I would also like to use the information from this book to help others. My dentist recently told my husband he has gum disease, and wants to do a lot of work on his mouth. I’m learning more about WAPF and really want to take this approach. This book looks like a perfect fit and now I’m really intrigued to see if this could work for our family. Thanks for the opportunity to know more about this book! I hope more people will catch on to this form of better health. Unfortunately I too have gum disease. I am in my mid twenties and have very bad receding gum lines. I’ve had a gum grafting surgery to correct this in one very severe area. This is a painful disease and I am strongly interested in learning alternative therapies. Do not want to undergo that painful surgery and long recovery again!! I like health books that are focused in their scope, yet make recommendations that will keep the entire body healthy. This seems like such a book. The topic of gum disease is one that I don’t see very often in my graduate program of human nutrition – the focus is usually on other things, like diabetes, overweight, and cardiovascular disease. Oral health is very important to overall well-being. I hope this book provides a strong scientific basis for its claims and presents a compelling argument for dealing with gum disease. The review suggests that it does! Both my husband and I have gum disease. Learning how to care for our teeth has been fun and hopefully rewarding. I feel blessed to teach my 3 children how to properly care for their bodies.